Bonus data promotion from 12/6/2016 – 3/31/2017. No additional charges for calls within the U.S.
Every month upon recharge, you will get $10 worth of FREE international calling access to call anyone, anywhere in the world. To use this feature, you must dial 1-213-808-6199 before making calls. h2O number is required to be provided in the shopping cart, and minutes will be directly loaded to the provided h2O number. We will be calling h2O IVR or refilling it through their website to load the pin for you so please give us at most 1 hour to load it during our business hours. If you ordered outside of business hours, we will load it for you on the first hour that we open. Due to the manual nature of this product, this is not covered in our Instant Delivery Guarantee. h2O Wireless ® logo and the h2O Wireless Unlimited® product images are registered trademarks of h2O Wireless®. 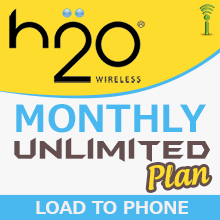 CallingMart is in no way affiliated with h2O Wireless® or any other entity for which a logo or name may be present. CallingMart refers to these logos and or names solely for the purpose of demonstrating the products and or services that it resells.